At the beginning of every season, sportscasters often forecast who will triumph. They usually are wrong. Stock pickers are no better. With stocks, though, you can back a whole bunch of teams at once. That’s called diversification, and it has a pretty good record. The professional talking heads on radio and television base their team predictions on evidence, but they are ultimately just guesses. Their often-misguided guesses do not cost them anything. Rarely is a sportscaster fired for a false World Series prophecy. But the consequences to putting all of your bets on the supposed best performing individual companies in the stock market with real money can be very great. If history is any guide, your odds are not favorable. 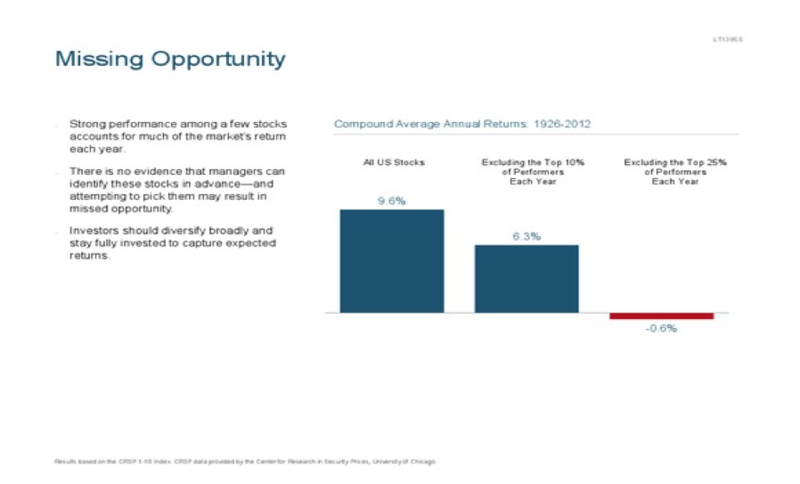 By diversifying, you know that you definitely don’t miss out on the winning stocks’ gains. The graph below, from Dimensional Fund Advisors, highlights the challenges that individual stock pickers face, and this includes the professional managers at mutual funds. Just a few outperforming stocks account for a disproportionately large share of the U.S. market’s return in a given year. From 1926 to 2012, the U.S. stock market returns, as measured by the Center for Research in Security Prices 1-10 Index, provided a 9.6% compound average annual return. However, if the top-performing 10% of stocks are excluded each year, the market’s annualized return drops to 6.3%. Excluding the top 25% of company performers each year reduces the market’s average annual return to a negative 0.6%. So it’s clear that picking the right stocks could be extremely lucrative, but betting on all stocks in the index is also very likely to build wealth, as well. You might say that you prefer just picking those good stocks with breakout performance rather than waste money on the middling stocks. But it is impossible to reliably identify winners before the fact. Take the stellar performance of Apple last summer. Around when the stock peaked in September, the Wall Street cognoscenti predicted (not unlike sportscasters) that the iPhone maker’s market capitalization was sure to reach $1 trillion. In fact, the star stock of 2012 steadily fell since last fall. The most prudent approach is to maintain broad diversification and consistent exposure within a particular asset class. This improves the likelihood that a portfolio captures out-performance, wherever it occurs. It is like knowing who wins by choosing all the teams in the league. The aggregate historic returns of the global stock markets should be sufficient for most investors.